Museum plans to restore and rebuild old marine hospital at a cost of $18.5 million. 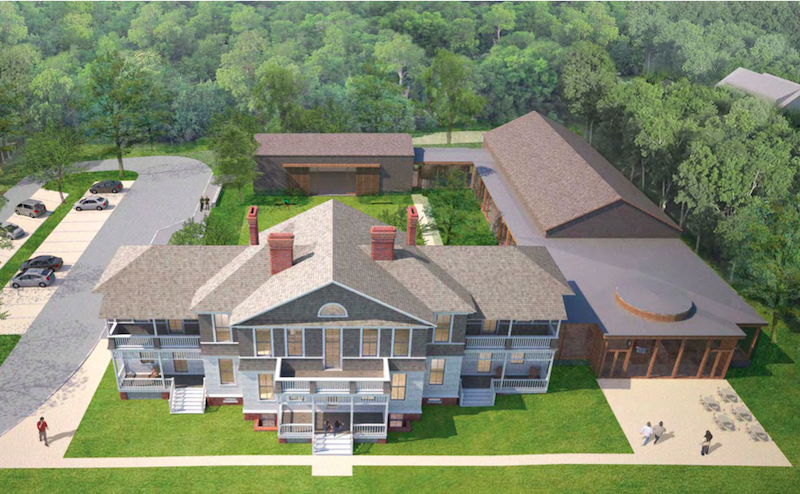 A public hearing opened this week before the Martha’s Vineyard Commission on an ambitious two-phase plan by the Martha’s Vineyard Museum to build a new $18.5 million campus at the site of the old marine hospital in Vineyard Haven. Traffic studies, a plan to connect to the town sewer and results from an archeological survey are all now in front of the commission, which is reviewing the plan as a development of regional impact (DRI). At its meeting on Thursday, the commission heard opening presentations from museum leaders and began taking public testimony from a crowd that nearly filled the meeting room in the Olde Stone Building in Oak Bluffs. 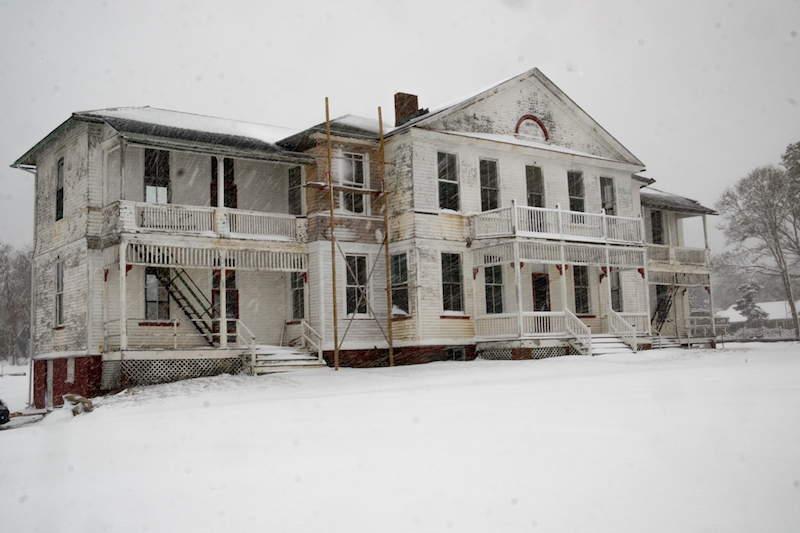 The marine hospital was built in 1895 and later served as a summer camp but has sat vacant for nearly a decade. The museum bought the property in 2011 for $2.9 million. Since then it has staged fundraisers and other events on the lawn overlooking Lagoon Pond and the Vineyard Haven harbor. Architect Conrad Ello, landscape architect Joe Wahler, traffic engineer Bill Scully and civil engineer George Sourati all gave presentations. In a staff report, commission DRI coordinator Paul Foley flagged some key issues, including a proposal to connect to the town sewer, which will go before voters at the annual town meeting in Vineyard Haven in April, and a projected surge in visitors at the new location. The museum had about 5,000 visitors in 2016, but hopes to see annual attendance grow to 80,000 per year over the next decade at the new location. Originally the Dukes County Historical Society, the museum has been located in downtown Edgartown since 1932. In his presentation on parking and projected traffic flows over five years, Mr. Scully said about two thirds of traffic at peak times in Vineyard Haven will pass through the Five Corners intersection just up the road, a notoriously congested spot which among other things channels nearly all the ferry traffic in Vineyard Haven. “Certainly we want to encourage pedestrian and bicycle trips,” he said. He anticipated a peak of 64 vehicles on weekday afternoons in the summer and 24 on Saturdays,including arrivals and departures, suggesting the new traffic would be only a drop in the bucket at the Five Corners. “We’re not adding a tremendous amount of traffic to that condition,” he said. Mr. Ello gave a lengthy presentation on the master plan for the site, which calls for an additional 20,000 square feet of space, much of it for storing collections. Phase one calls for removing a 1938 brick annex, renovating the 1895 hospital building for administrative offices, a classroom and other spaces, and building two new structures: a glass pavilion for the 1854 Fresnel lens that once sat atop the Gay Head Light, and a separate building across a courtyard for vehicles and vessels from the collection. Phase two will add a storage building that connects the pavilion and the building for vehicles and vessels, leaving the courtyard enclosed on three sides. 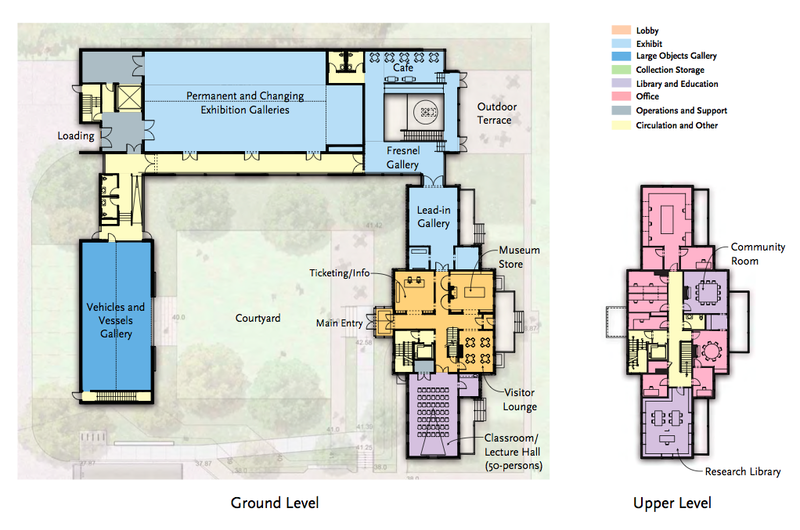 The museum plans to use both the courtyard and the sloping lawn in front of the main building for events. 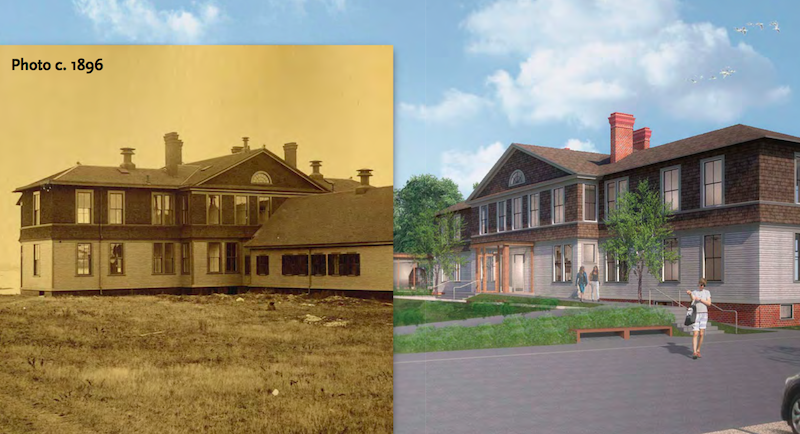 Plans call for meticulously restoring the hospital building to its original appearance, preserving nearly all the existing materials, but adding a new shingled exterior on the second level, a cedar-shingled roof and replicating four original chimneys that appear in early photographs. Mr. Ello said the hope is to submit the building for listing on the National Register of Historic Places. Vineyard Haven selectman Melinda Loberg said the town is excited to have the museum, calling the site overlooking Vineyard Haven Harbor a gateway to the Island. “Their decision offers us some challenges as a town and community, and some opportunities, which we are embracing,” Mrs. Loberg said. She emphasized that connecting the new campus to the town sewer would address a key issue by removing wastewater from the watershed for Lagoon Pond, one of the most impaired saltwater ponds on the Island. Frank Daly, the closest abutter, raised concerns about feral turkeys backing up traffic along Skiff avenue, a residential road near the site. Others noted that there is no sidewalk on the Lagoon Pond Road, which runs over a bridge from Five Corners and would likely be a main access road for pedestrians and cyclists visiting the museum. Responding to a question from commissioner Clarence A. (Trip) Barnes 3rd about the cost of heating the glass pavilion, Mr. Ello said the roof of the collections storage building would have a favorable exposure for solar panels. The main presentation by the applicant took up the bulk of the time. The hearing was continued to April 6, when more public testimony will be heard. Great to see this organization growing and moving forward on this project. Can't wait to see the new museum open. I am a history lover who is embarrassed how little I really know about the history in my own backyard. Get those doors open! Weak town leadership, feral turkeys, and odd heating concerns will doom this worthwhile project. It's what Tisbury does best--create problems on any effort to improve their town. Just look at the failed Stop & Shop endeavor. I agree. I hope the mentality of the VH selectmen won't doom this project. They hate change. They really want to maintain a dying business district. Go figure! And the Ernie Boch project on Beach Road! What a visionary step for MV. This company knocked it out of the ballpark on beauty+environment consciousness for the WT Lib and looks like they are at it again. ^^I agree, get those doors open! Can't wait to see Aquinnah's story told with the lens, Can't wait to see what education programs come around for island kids with their wonderful Ann & Beth. What does "It’s a marquee site anywhere on the Island.” actually mean? "anywhere on the island"? That is meaningless. A great location and it is in walking or biking distance from the Steam Ship Authority in Vineyard Haven for those coming in from off island. The Traffic issue can be worked out by coming in from Edgartown - Vineyard Haven Road by Skiff Lane. It not as if all the traffic will be going to the Martha’s Vineyard Museum just those wanting to see and be entertain by the Island history. I hope the Museum considers Aquinnah's invitation to display the Fresnel lens near the Gay Head lighthouse, in its historic context. The Hospital is a beautiful building and site, but the lens would best be displayed next to the lighthouse.